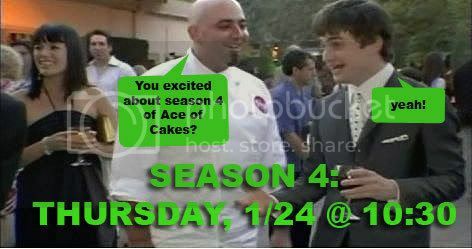 Who's excited about the season 4 premiere of Ace of Cakes? Evidently the Harry Potter bloggers are. I never realized how huge a phenomenon they were until I started getting news updates from ALL (and there are a lot) of the Harry Potter fansites. Even Rupert Grint (Ron Weasley) has a blog or two devoted to him, all announcing major excitement over seeing Rupert in the AoC commercial! I'm wondering what they'll post after the episode actually airs. And I can't even keep up with all the Daniel Radcliffe blogs. They all call him "Dan." I am OBSESSED with Rupert Grint. Thank you for the link. I will love you forever and supply you with lots and lots of food. I am excited to see how much of the cake is edible. I know it's not Duff's style to use plastic cones and decorations but it will be cool! I'm definitely excited for the new season to start. Looking foreword to the fun & hilariousness (is that a word? )that will surely ensue. Wow, talk about selling out and whoreing for new viewers. Harry Potter geeks are absolute freaks. Get a freakin life for Christ's sake. Dude , at least the FN people you speak of and refer to in your blog are real . I wonder how many groupies Dumbledore has? So I have to admit, I as a bit disappointed in this episode :( There wasn't a whole lot of cakin' going on - you know what I mean. The whole fricking castle was Styrofoam! I just expected more. I will give props on the trees. That was a cool idea to do that with the trees and the water. shannon: wow! i look forward to it. you're welcome. wendy: of course it's a word. alec: i'm sure ole' dumbles has a LOT of blogs devoted to him. tablebread: yeah, it would have been fun to be more cake-y, but you do what the client wants. I don't get why they didn't just bring fly him and the staff out there to do it all, though.